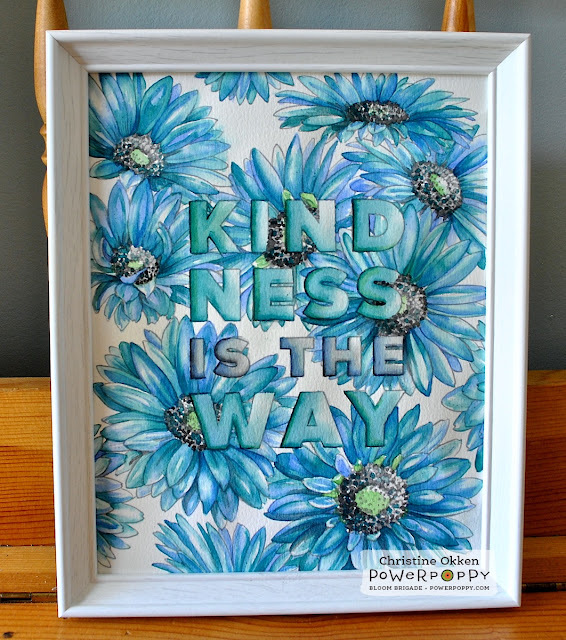 Introducing Kindness is the Way! Here is Marcy’s description of it. 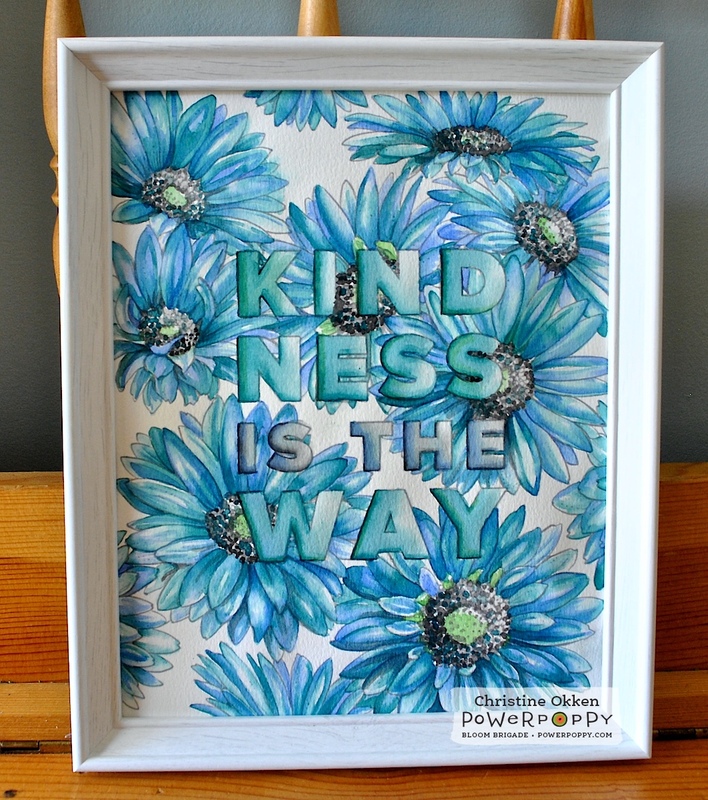 Our first 100% FREE download with a botanical theme — I am proud to offer Kindness is the Way here at Power Poppy. 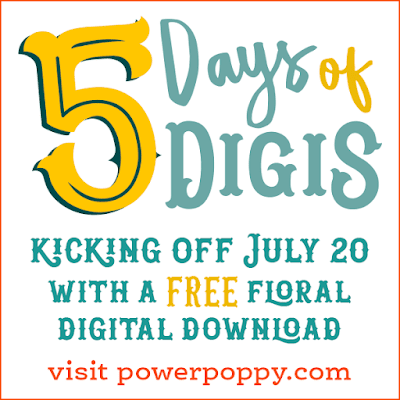 Whether you've never worked with digital stamps before and want to give it a risk-free try, or you are an experienced digital download aficionado in search of new flowers to color, this image is here for you! I've prepared an allover pattern of Gerbera Daisies in black and no-line versions. Then you also get two versions of the background with the phrase "Kindness is the Way" superimposed, using lettering that you can color in. 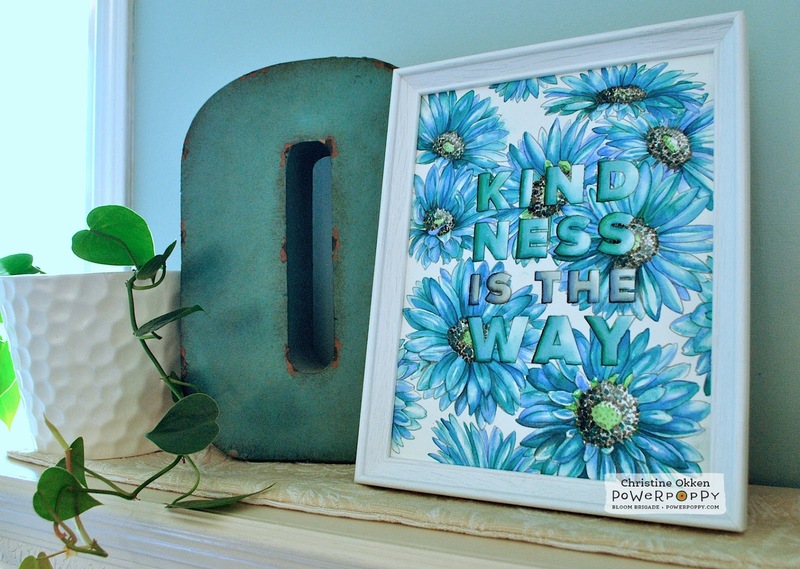 Lastly, a single Gerbera Daisy is included in case you want to just keep things simple. As you can see I decided to make a larger piece for my home decor. I love that about digital images. They are so easy to manipulate to a much larger size without taking away from the integrity of the original drawing. This is an 8 x 10 sized piece. We’ve done a lot of work around our house this spring and summer, and I’ve done a lot of painting inside the house, so now I’m looking to put different artwork on the walls. I’ve always had this dream of having art with encouraging verses and words for us to be inspired by, so when I saw Marcy’s illustrations for this release I knew it was perfect for my theme! You can see how it looks on our mantle in the photo at the beginning of the post. What family doesn’t need that reminder for how we treat each other and how we live in this world of ours! 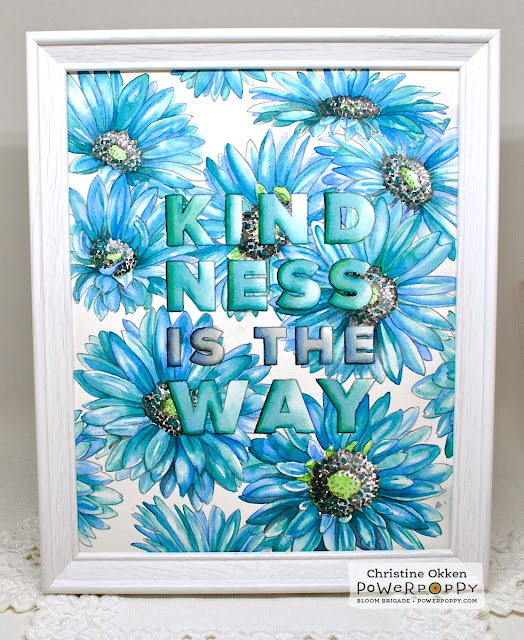 I took my time and watercoloured this beauty in shades of blue, blue-green, grey and green with my Gansai Tambi watercolours on Arches Cold Pressed Watercolor paper. I use 90 pound weight for digitals because it runs through my printer perfectly. Here is what it looks like in more natural light, so you can see more of the texture of the paper, which I always think is part of the beauty of watercolour. Here’s just a peek at what part of the digi looks like, there’s so much more in the actual FREE image. Pop on in to the store and pick it up! And thank you Marcy for your kindness in bringing all of us such a lovely design! I’ll be back tomorrow with some more from this release, hint....it’s another piece of watercoloured artwork! How smart, I never thought to use watercolor paper! Totally need to try this. This is really so amazing! I love that you did a large size and framed it.. Really beautiful. Christine, this is gorgeous! Your water colouring is amazing, love all the tones you used. What a great idea to frame this, a lovely piece of artwork with a wonderful sentinent! Thanks for sharing.